Whether you’re off to Oahu, Maui, Kauai, or the Big Island, if you’re trying to get some ideas for Hawaii outfits and figure out what to wear in Hawaii and what to pack for Hawaii, there’s a good chance that you have most of the clothes you need. So, what might you want to wear for your vacation in Hawaii? 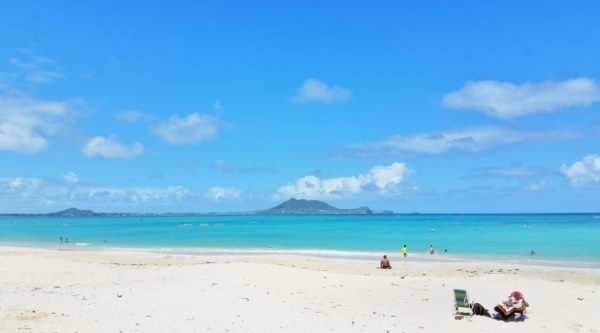 Here’s where to go snorkeling on Oahu. If you’ve never been snorkeling before, you might not have snorkeling-specific clothes, but you can get by with a swimsuit and swimwear you already have. Or, are you in the market for a new swimsuit or cover-up? Take a look at these! That’s for women. For men, take a look at these. There are also clothes that you can wear when snorkeling in Hawaii to protect you from the dangerous UV rays. In thinking about what to wear in Hawaii when you’re at the beach, the most important thing to think about is… the SUN! Especially because the sun rays may be stronger than you’re used to. You don’t want to get burned on your first day at the beach, and then end up in pain for the rest of your time in Hawaii! There are special shirts that have built-in UV protection with up to UPF 50 protection. Wearing these kinds of shirts means that you also don’t have to worry about constantly reapplying the sunscreen after continuous exposure to water. Although there is sunscreen that’s better made for lots of time in the water, like some of these types of sunscreen. Even if you’re wearing clothes with the UV protection, you’ll want to make sure to cover the rest of your exposed skin. There is a certain type of sunscreen that would be considered the best sunscreen for Hawaii. Both Sun Bum and Neutrogena have this certain type, but you’ll need to check the ingredients list. There’s a bit of controversy when it comes to wearing sunscreen when snorkeling. Some scientists firmly believe that ingredients found in sunscreen can be toxic to coral reef, which contributes to the reef dying. It would seem that the vast majority of the snorkeling and scuba diving community also believes this. This is the popular opinion among avid snorkelers. As with many scientific studies, you will find other scientists who don’t subscribe to this theory. Read about that here. If coral reef die, also known as coral bleaching, that means fish go elsewhere. This means that popular snorkeling destinations can no longer offer the abundance of marine life. So should you go out of your way to find and wear sunscreen that’s designated as coral reef-safe? Well, if you wear sunscreen that is reef-safe, no matter which theory is true, you’re not hurting the coral reef! If you wear sunscreen that’s not reef-safe, if the one theory is wrong, you may be contributing to the dying coral reef. But generally, if you’re buying reef-safe sunscreen with the goal of saving the coral reef, you’ll want to take a look at the ingredients. Also consider that the more clothes with UV protection you wear when snorkeling, the less sunscreen you have to apply. More of what to pack for Hawaii snorkeling! 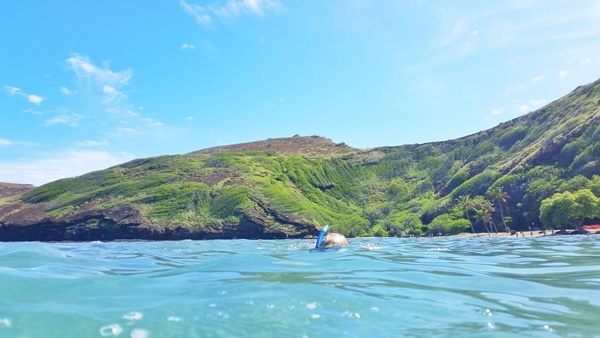 For a more in-depth look at packing for snorkeling in Hawaii, including this full-face snorkeling mask that can be good for beginners, have a look at what to wear snorkeling! 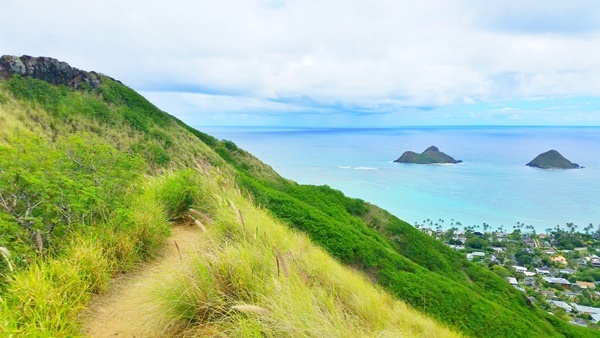 Here’s where to go hiking in Oahu. So when you’re snorkeling, you could say one of the most important things is to make sure you get enough sun protection. For hiking, you also want to protect your skin from the sun. But besides that, one of the most important things to wear hiking in Hawaii would be footwear that gives you good traction. Many of the hikes in Hawaii have portions that can make it a little slippery even if you are wearing shoes with good traction. This means wearing footwear with very little footwear can make it quite a bit easier to slip. What can sometimes make the trail slippery is the loose gravel combined with with steep slopes. If you don’t want to wear full-fledged hiking shoes like these (that would be one of the best choices! ), there are hiking sandals that you can wear too. They can give you that traction you’ll want on the trails while giving your feet a little extra breathing room. For popular hiking trails in Hawaii, wearing hiking sandals can work out well. Regular flip flops are just not a good idea because of that risk of slipping. And while we’re at it, because it is that important to carry with you when hiking… WATER! More of what to pack for Hawaii hiking! 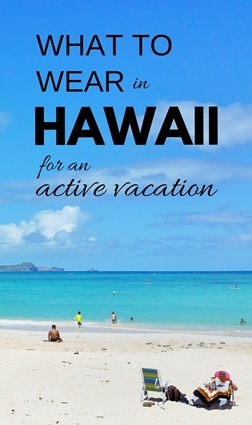 For a more in-depth look at packing for hiking in Hawaii, have a look at what to wear hiking. Here’s a list of where to go for a luau in Oahu. If you’re off to a luau in Hawaii to take in a bit of Hawaiian culture in the form of music and dancing, you have probably also wondered what to wear to a luau. Now, if you want to actually see what people wear to a luau, take a look at some of these pictures below. It will require a little bit of squinting maybe 😉 but you can see that people are generally wearing normal street clothes. These are pictures at the Polynesian Cultural Center. See the visitors like you 😉 (not performers) in the canoe, and you can also see what people are wearing in the background. The vast majority of these people attended the luau here in the evening, so it’s what they wore to the luau. Also have a look at these pictures. They are also at the same place. But these ones are at the actual luau or buffet dinner, and you can look for the pictures of people sitting at the tables to see what they are wearing. 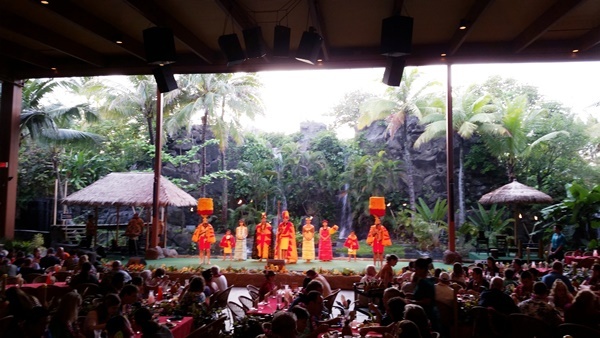 Also be sure to take a look at things to do with Polynesian Cultural Center tickets! Of course, if you want to show more of the aloha spirit when you go to this traditional Hawaiian event, there will be no problem doing so! 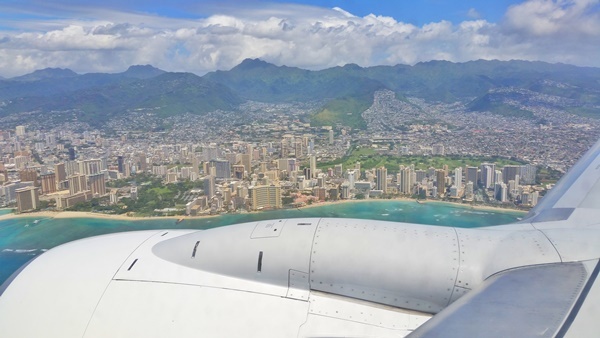 Here’s where to sit on your flight to Honolulu Airport for the best chance at the best views! What to wear on a flight to Hawaii is quite the dilemma, because you’re traveling to a warm weather destination, but it’s not so warm when you’re flying! Although it depends on your tolerance for the cold, it can get a little chilly on the plane, especially if you’re just wearing a sundress and flip flops! So instead of packing your warmest clothes in your suitcase, wear them! If you’re already planning on taking jeans, then those would be a good item to wear on your flight to Hawaii. If you’re not planning on taking jeans, it can be a good idea to wear them or some other form of long pants that you have. These are comfortable capris. Evenings in Hawaii can get chilly with a light breeze even in June or July, although not always. If you’ll be flying to Hawaii from cold weather in the winter months like in December, January, or February, you may consider getting a packable down jacket like one of these. This will get you to the airport from your home without freezing, and you won’t have to carry a heavy jacket and lug it around once you land in Hawaii in the 80 degree weather! It will also make it so you won’t have to worry so much about being cold on the plane. Packable jackets are space savers and can be packed down to a pretty small size when you’re not using them. These things will also help you pack your suitcase better so you can find all of your packed items once you reach Hawaii! If you’re not planning on taking shoes with you to Hawaii, consider packing a pair (or two!) of socks in your carry-on bag. This way, if you’re wearing sandals on the plane, you can keep your feet warm! Wool socks like these could be good to wear to keep your toes comfortable.